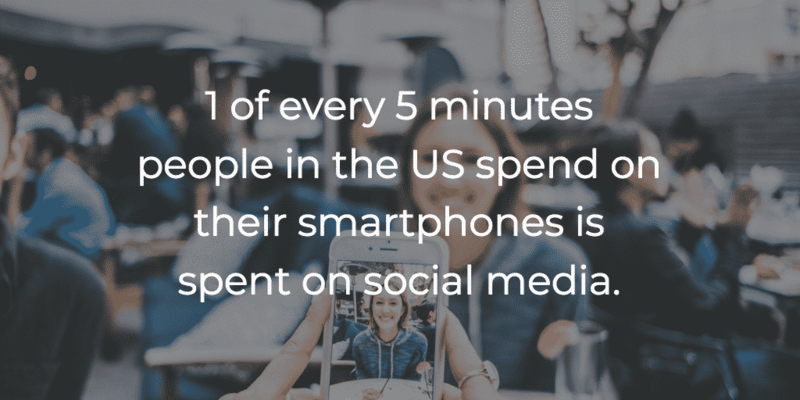 On average, people worldwide are spending 135 minutes per day on social media, so it’s no surprise that to marketers, social media is a critical part of a shopper’s path to conversion. It can be a challenge however, to efficiently coordinate marketing to a shopper on both the open web and in a closed platform such as a social network, so connecting your campaign between social media and non-social platforms is extremely important. As social media takes up more time of a user’s day, it’s important to stay at the forefront of their attention. Social media retargeting works by connecting you with shoppers who have already visited your site on social channels while incorporating shopper behavior from the open web. As shoppers browse elsewhere after they leave your site, social retargeting can reintroduce them to products they’re already interested in — and offer them a promotion that encourages them to return to your website and purchase. Facebook and Instagram make it easy for marketers to retarget consumers with a variety of ad formats. When someone visits your website and adds something to a cart, views a product, or buys something, your retargeting partner drops a cookie to report this action. The cookie lets your retargeting partner know when one of your bounced visitors appears on another site or social platform, such as Facebook or Instagram. The cookied visitor will then be served an ad based on prior engagement and purchase intent. As more actions are taken on your site, your retargeting partner will improve at displaying ads to the right person at the right time, on the right device. Let’s look at a real-life example of how it works. Let’s say Jennifer is browsing your website. As she moves through initial search, listings, product view, and basket, her intent data is captured at each level. Jennifer finishes browsing, but gets distracted and leaves your website to browse on Facebook, either on her desktop or mobile phone, where the retargeting process continues in real-time. Jennifer’s purchase intent is calculated, the product recommendation determined and dynamic design of the ad occurs in real-time. The ad is displayed reflecting the products Jennifer viewed, plus new discoveries based on items such as availability. Jennifer leaves Facebook and goes to the Washington Post, where the retargeting process continues. A few hours later, Jennifer checks her Instagram, where she sees the ad, clicks, and is deep-linked back into the product page of your website or app to complete her purchase. The right retargeting partner can help you create one unified, cross-channel experience for shoppers and drive more sales than a siloed retargeting approach. Our unique ability to connect the dots between social platforms, premium publishers and ecommerce sites can help you gain a granular understanding of each shopper’s complete web journey, not just their journey through social media. Criteo Dynamic Retargeting for Facebook and Instagram can help you achieve unmatched performance across Facebook and Instagram by offering a granular understanding of each shopper’s complete web journey and real-time purchase intent, from mobile and in-app to desktop. Current clients using Criteo Dynamic Retargeting on Facebook and Instagram see an average of 12% sales uplift across all their retargeting campaigns. With personalized and dynamic creative, social media retargeting is a powerful formula for driving not just sales, but valuable brand engagement. Read on to see how three of our clients found success with Criteo Dynamic Retargeting for Facebook and Instagram. French fashion and home good retailer La Redoute looked to Criteo to expand Criteo Dynamic Retargeting campaigns into Facebook Dynamic Product Ads. Criteo’s Dynamic Retargeting evaluates each shopper’s journey across thousands of publishers and devices in order to access purchase intent. The Criteo Engine then predicts the optimal personalized offer to display on Facebook for maximum sales conversions – all in real time. By adding Facebook Dynamic Ads to its existing Criteo Dynamic Retargeting campaigns, French fashion e-tailer La Redoute was able to convert 10% more customers and triple conversion rates. Their integration with Facebook Dynamic Ads and ability to capture purchase intent across shoppers’ journeys helped La Redoute reach customers when they were most likely to convert, generating 28% of incremental sales from new product discoveries, at 49% lower cost of sale. One of the top 30 online Swiss retailers, Vedia has been partnering with Criteo since 2014 to reach customers with highly personalized messages. Seeking to unlock even more sales in additional channels without increasing marketing spend, Vedia turned to Criteo again to incorporate Facebook Dynamic Product Ads. Leveraging Crtieo Dynamic Retargeting to power their Facebook Dynamic Ads Campaigns, Vedia used Criteo’s programmatic technology to reach new shoppers across Facebook and increased sales by 15% across all campaigns. Further, being able to evaluate a shopper’s complete journey across Criteo’s immense network of 16,000 direct publisher partners along with Facebook inventory, Vedia decreased campaign CPO by nearly 20% and COS by 7%. Noticing a plateau in the sales and reach from their existing performance marketing campaigns, Soft Surroundings, a woman’s retailer, partnered with Criteo to expand their display and social retargeting efforts in order to grow overall online sales. By implementing a combination of Criteo Dynamic Retargeting campaigns, including campaigns for Facebook during the holiday season, Soft Surroundings were able to fully optimize their campaigns for peak results. Criteo managed bids day-to-day for peak results, dramatically expanding Soft Surroundings’ channel mix to increase traffic and generate positive social interactions. In Q4 of 2015, Facebook Dynamic Product Ads increased Criteo post-click sales by 20%, site traffic by 210% and online sales by 775%. With nearly 3 billion combined monthly active users on Facebook and Instagram, it’s obvious that businesses can see a massive benefit from integrating social media retargeting into their marketing strategies. These social platforms have evolved into powerful marketing machines through which marketers can extend their reach in rewarding ways. When used strategically, social retargeting can be an incredibly effective way to capture more sales and build relationships with shoppers after they’ve left the site. To learn more, download the ebook below!